Dan Aykroyd and John Belushi have long been heralded as one of the great comedy duos, but they only shared three films. I say “shared” because in one of them, Steven Spielberg’s underrated 1941, Aykroyd and Belushi never actually had any scenes together — they occupied two separate storylines in a movie full of storylines.¹ That leaves The Blues Brothers and Neighbors, and of the two, Neighbors appeared at first glance to promise greatness. 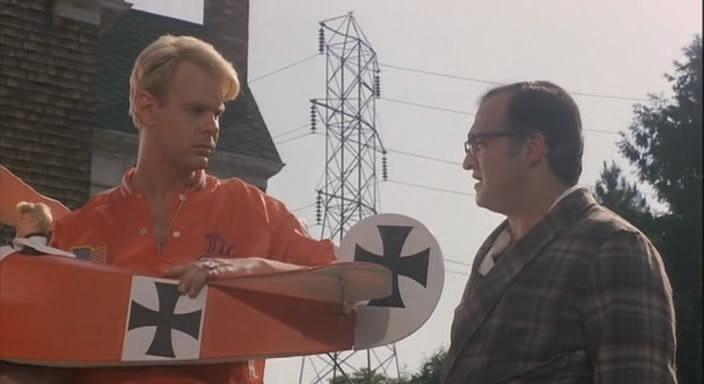 Based on a novel by Thomas Berger (Little Big Man), it cast Belushi against type as milquetoast suburbanite Earl Keese, a quiet lump besieged by anarchic new neighbors Vic (Aykroyd) and Ramona (Cathy Moriarty). Berger’s hip, acclaimed novel — trust me, it reads better on the page than it plays onscreen — provided something few SNL performers had enjoyed before: a literary pedigree. What we ended up with was crude farce, with Aykroyd braying to the rafters as the irrepressible Vic, while Belushi stubbornly, honorably stayed on point as the repressed Earl. Sadly, Neighbors represents the swan song of both the Aykroyd/Belushi project and Belushi himself, who was dead within four months of the film’s late-1981 premiere. What’s wrong with the movie isn’t Belushi’s fault. He plausibly plays a sad sack in his mid-40s — and, again sadly, also looks the part, though he was only 32 at the time. We spend the entire hour and thirty-four minutes waiting, praying, for Earl to break out of his shell, and for Belushi to be let off the leash. This tension could have worked for the movie, but it doesn’t. Earl Keese, a man who leads a routine suburban life, sits calmly waiting for his dinner. Little does he know – This may be his last home-cooked meal . . .
For somewhere in time and space exists a world, a comic nightmare world, where anything can happen. A world that this reserved, hardworking homeowner is about to enter. In the next 24 hours he will experience things that he has never experienced before and leave behind things he will never experience again and somehow his life will never be the same. For Earl Keese is about to meet . . . The Neighbors. You can imagine Serling gritting his teeth reading that copy. The impression one gets from all this is that Neighbors will be disturbing, even scary (albeit scary-funny). But as directed by John Avildsen and adapted by Larry Gelbart it has no style whatsoever — comedic, horrific, or otherwise. It’s just a string of awkward moments, though we don’t feel embarrassed by any of it because nobody behaves in a way that makes sense. It’s very plastic satire, grounded not in real life or genuine observation but in easy, tired ideas of suburban life. Earl is tormented by Vic and Ramona and even by his own wife Enid (Kathryn Walker), who seems to despise him. Since, as written, Earl has no dimensions as a person, we don’t know why anyone would be moved to hate him or to expend so much energy on harassing him. Berger’s ironic comedy-of-manners prose is difficult to translate into film, but Avildsen and Gelbart don’t even try, making an overt live-action cartoon. This is underlined at every opportunity by Bill Conti’s aggressively awful score, which owes as much to Carl Stalling as to Marius Constant (whose Twilight Zone theme Conti swipes a couple of times). Belushi wanted the score to be recorded by Fear, the scabrous punk-rock band he’d discovered, but Columbia nixed that idea. It’s a shame, because this might’ve been a classic punk comedy. We get a glimpse of the path not taken when Earl’s daughter (Lauren-Marie Taylor) comes home from school and a snippet of Dead Kennedys’ “Holiday in Cambodia” plays on her boom box. The gnashing sound of Fear might have lent the movie some badly needed aural energy, but the direction and writing would still be bland and broad. Even the dialogue recording sounds amateurish, as if everyone dubbed their lines on the worst possible machinery. Seeing this in a theater must have been depressing, with the ridiculous score blaring and the dialogue resounding hollowly and the ugly cinematography emphasizing every bad costume choice. I’d love to be able to defend Neighbors as an arrogantly unconventional film (the punk thing again), but, boy, is it a rough sit. The small cult it’s gathered over the years can only be accounted for by residual affection for Aykroyd/Belushi. There’s a retrospectively touching moment when Vic seems to be leaving town and he shakes Earl’s hand goodbye. If the movie ended there, we’d have no choice but to think that Aykroyd was unknowingly saying farewell to his friend and to their brief but intense collaboration. But the movie goes on a bit longer and continues to be stupid and brings Vic back. For poetry’s sake, at least, if you find yourself watching Neighbors, turn it off after that handshake. ¹Now that I think about it, if I remember correctly, Aykroyd and Belushi might salute each other once, separated by street chaos, in shots that were probably filmed weeks apart. They still don’t interact in any meaningful way.